Sean: Prior to this trip to Asia I had heard few things from Ocean Park. 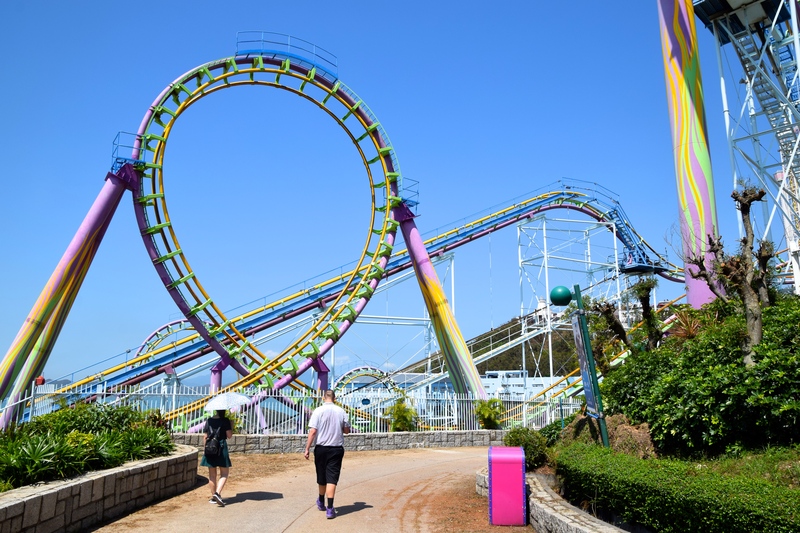 I had seen videos of their coasters, and of course knew all about their Arrow looper, but besides that I was unaware of the magnitude of this place. 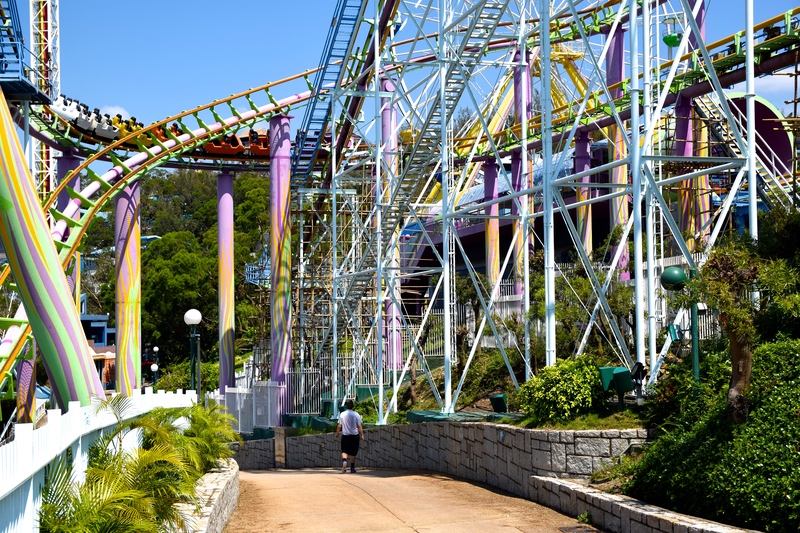 Clearly Ocean Park was Hong Kong’s only major park prior to Disneyland opening in 2005. 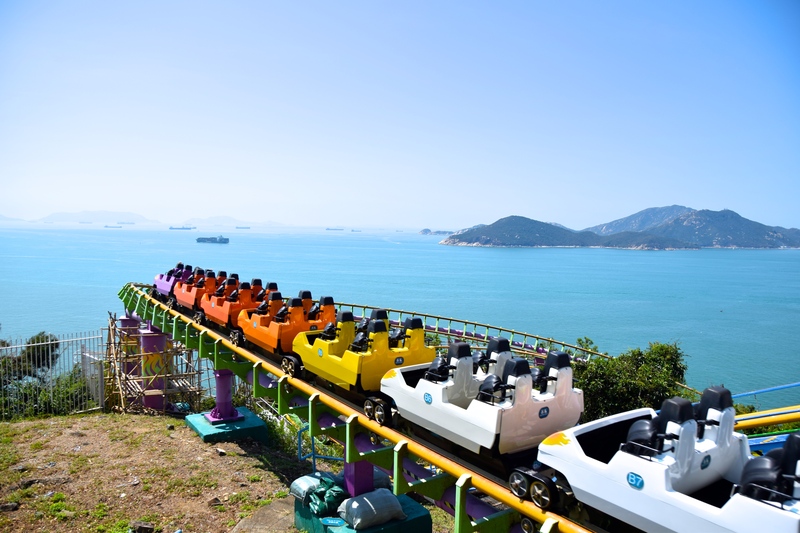 Ocean Park sits on a mountain over the ocean and is one of the most breathtaking theme parks in the world. 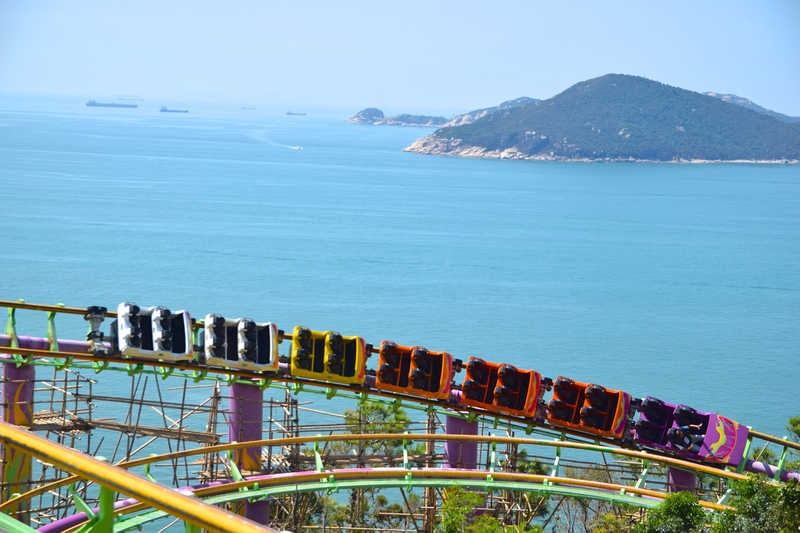 Perhaps it’s the world’s most scenic theme park. 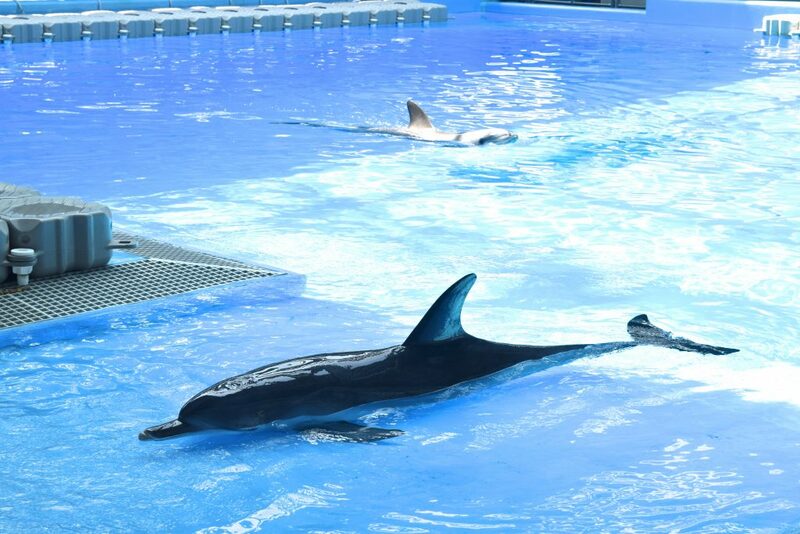 Join us around this massive marine-life, wild-life and theme park! 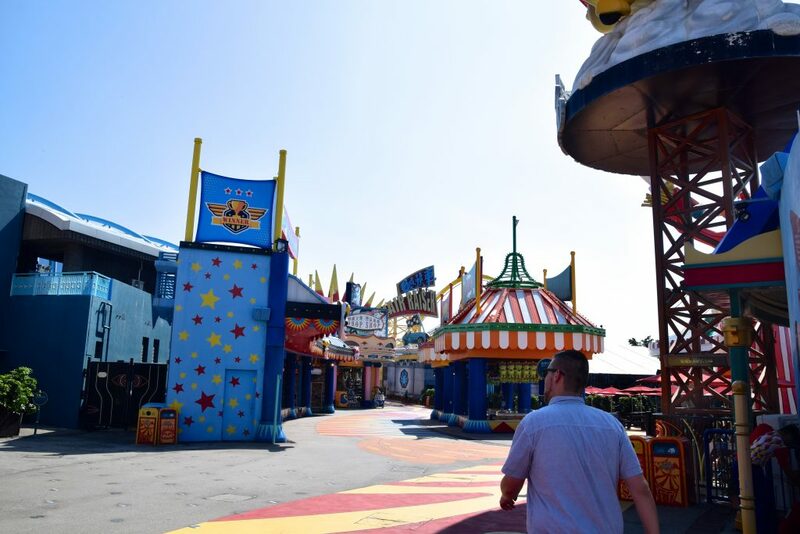 Upon a convenient public transit arrival to Ocean Park, which is working hard to convert themselves into a theme park resort with a new state-of-the-art Marriott hotel under construction, the park seemed to be missing something: the attractions. The entry to the park is clean and simple with some stores, dining, aquariums and a small lagoon. But what we were looking for is on the other side of the massive mountain. Guests have the option of taking the Skyride over the mountain/ocean to reach the back side of the park. 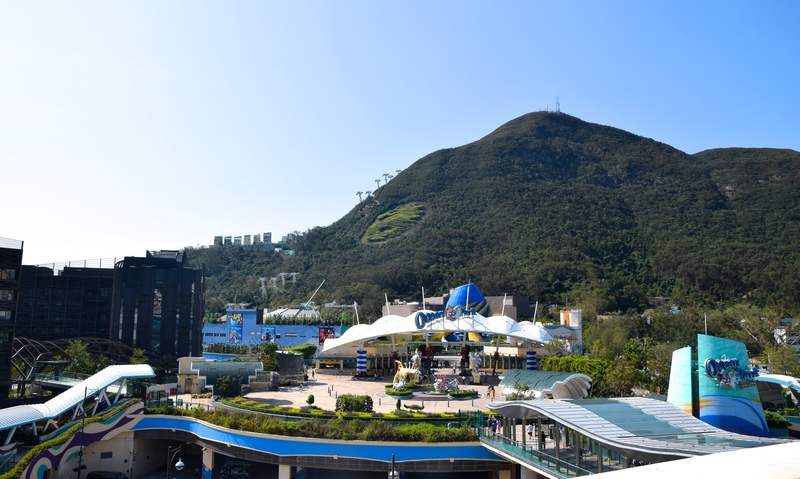 Unfortunately during our visit the Skyride was down so we took the funicular “Ocean Park Express” up. 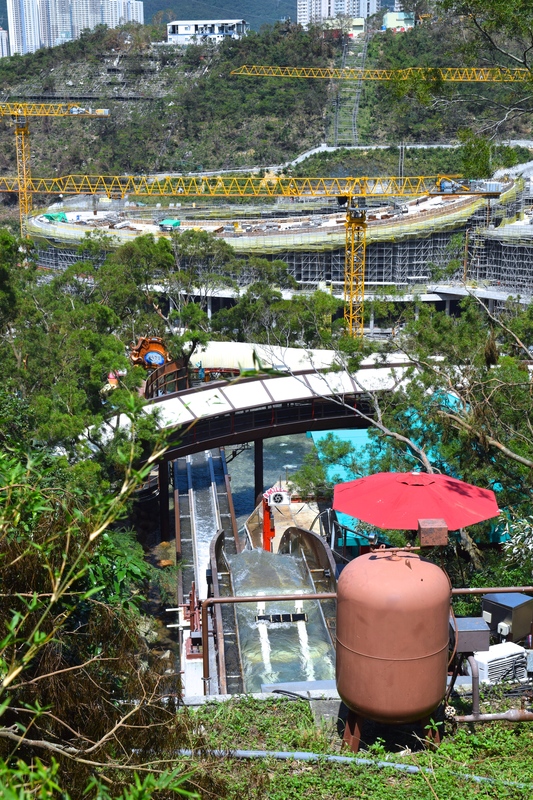 This is a high speed underground transportation option that still takes around 5-10 minutes to travel through the mountain. It then spills out on top of the mountain where guests have several options of themed areas to go explore. We headed up to the newest area of the park first, where Hair Raiser is located. The park’s terrain B&M Floorless coaster. As the first people in the silence of the area had yet to alarm me. 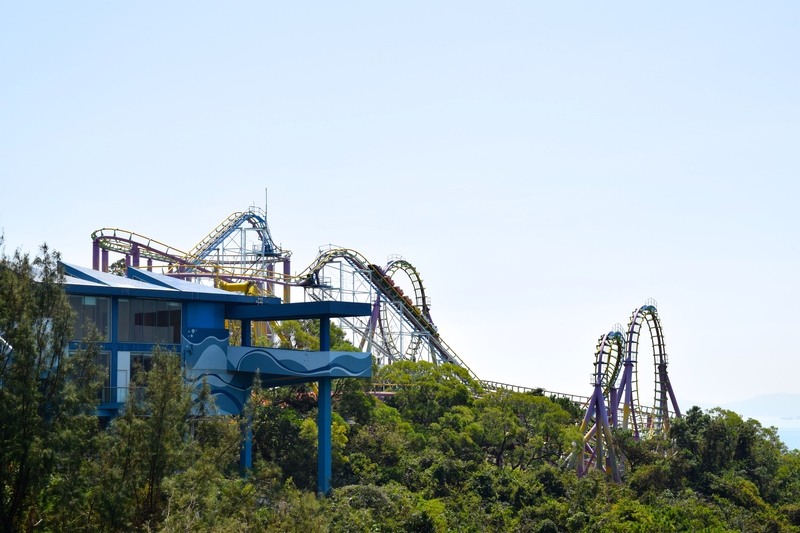 Unfortunately Hair Raiser ended up being closed for the day due to the big typhoon that had hit Hong Kong just a few days prior. 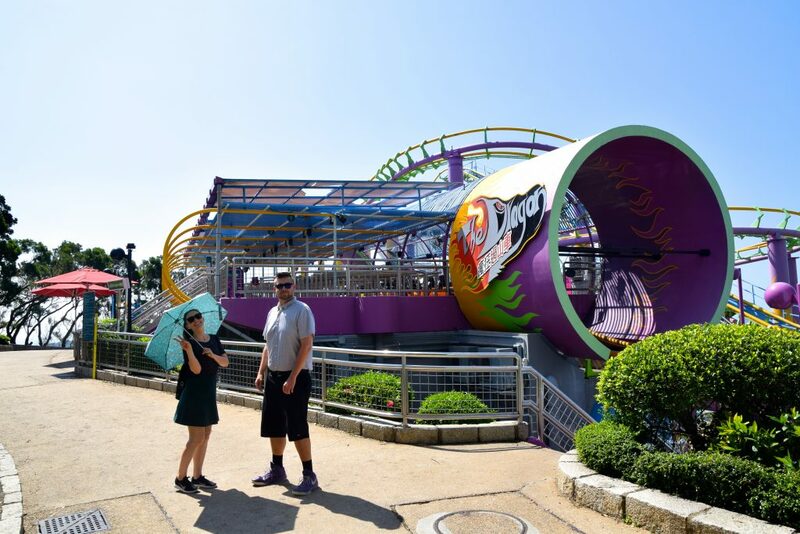 Though it was an important ride at the park for me to get on, the rest of the park made me forget Hair Raiser even existed. 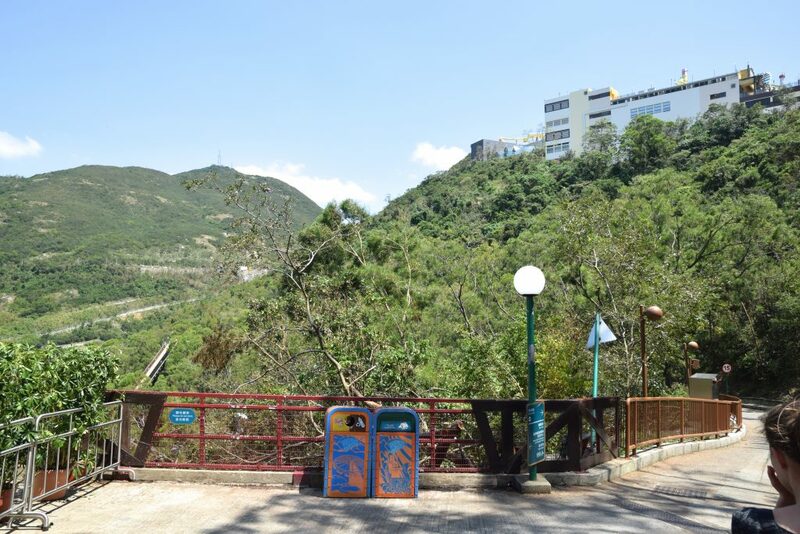 The fact that this massive park was able to clean up as much as they did after the typhoon was quite impressive. 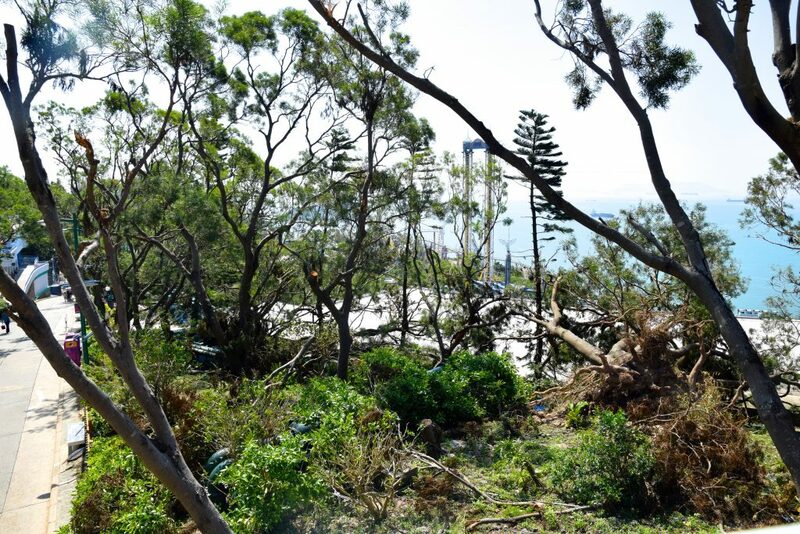 Evidence of the typhoon damage was noticeable all across the park. Our next ride of importance was The Dragon, the famous classic Arrow looper with a crazy color scheme and a dirt turn hundreds of feet above the ocean. On the way down we saw this wonderful artwork of what is The Dragon and the Eagle. 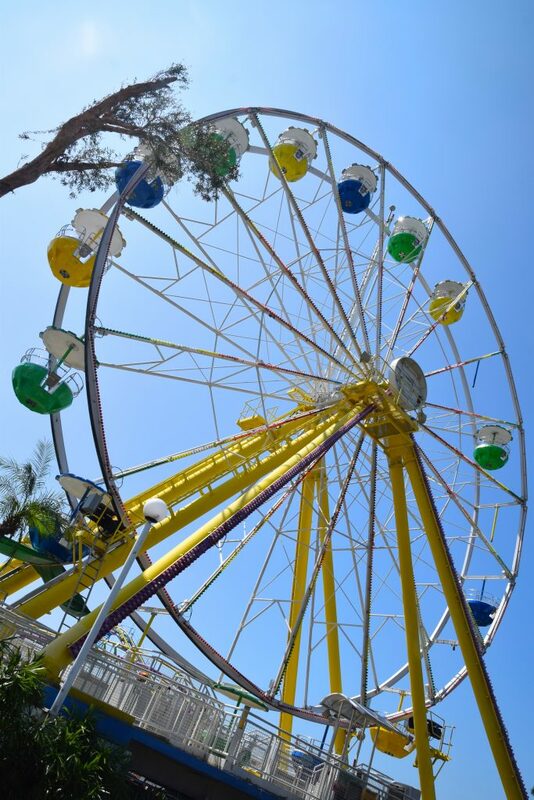 The park was busy repairing and preparing the reopening of the Ferris Wheel, which clearly was not operable, presumably because of the typhoon. Our goal was to ride as many ferris wheels as possible in Japan, but since we were in Hong Kong this ferris wheel got a pass. 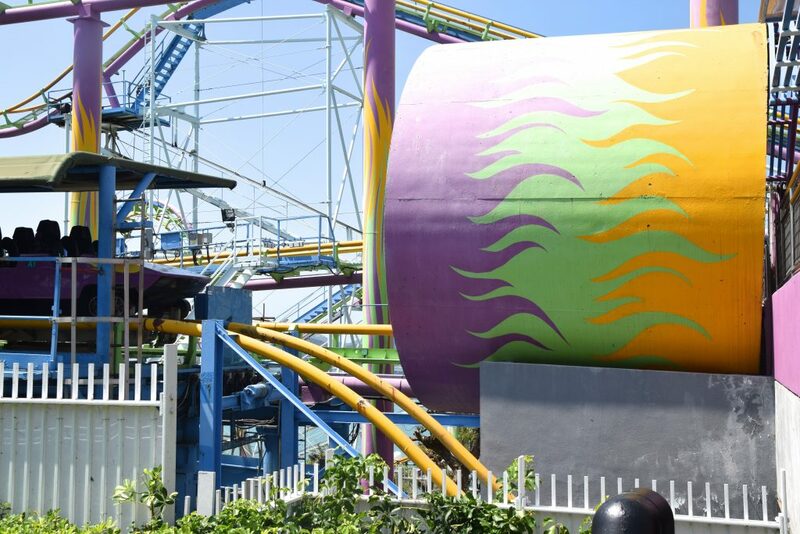 Here’s a closer look at the crazy color scheme, purple and green supports feature yellow flames while the track itself is also made up of those three colors. The Dragon has a handy digital sign that displays the wait time. The station is set up quite unconventionally with a separate set of switchbacks for all cars. So really the station is one big room of 7 sets of switchbacks connected. Luckily we did not have to worry about that. As the only people down here this early in the day, we walked right on and rode a few times. Just like some other old Arrows, the transfer track and maintenance room feature a steep drop into the storage below the station! Let’s walk around this beauty for a bit while we enjoy jungle-level humidity and tropical views of the ocean, mountains, and steel. 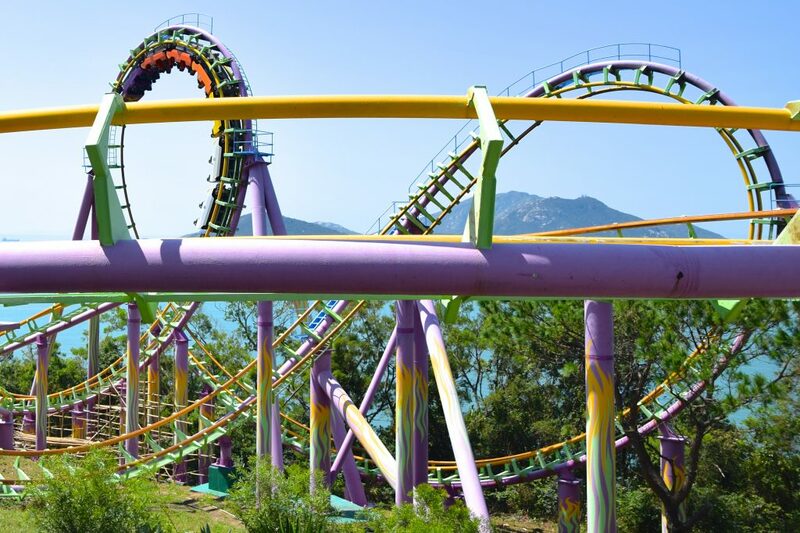 The Dragon‘s layout reminds me of Ninja at Six Flags Magic Mountain. 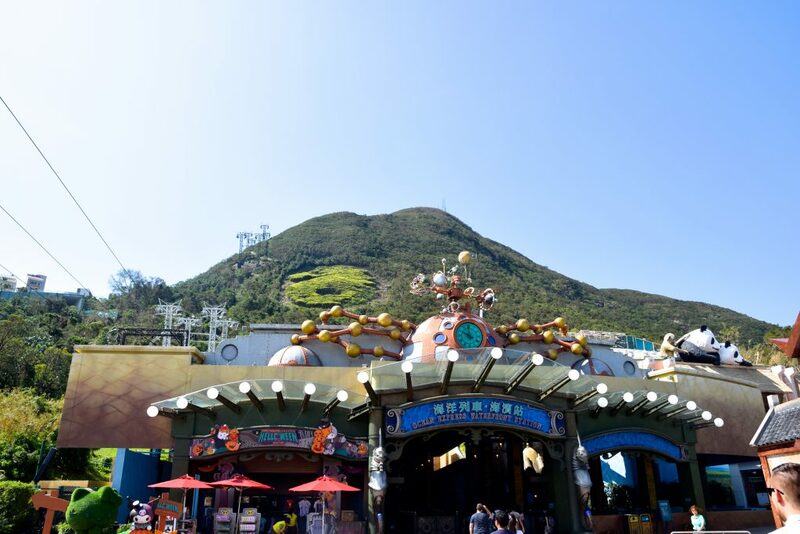 Due to being located on a mountain the station is far above the majority of the ride. That means a lift hill to create height, and then a lift hill to return to the station. Unlike Ninja, both lift hills on The Dragon are in opposite directions due to space limitations, thus there is a pretty lengthy straight pre-drop, as well as a lengthy straight post-lift to reach the brakes and station. 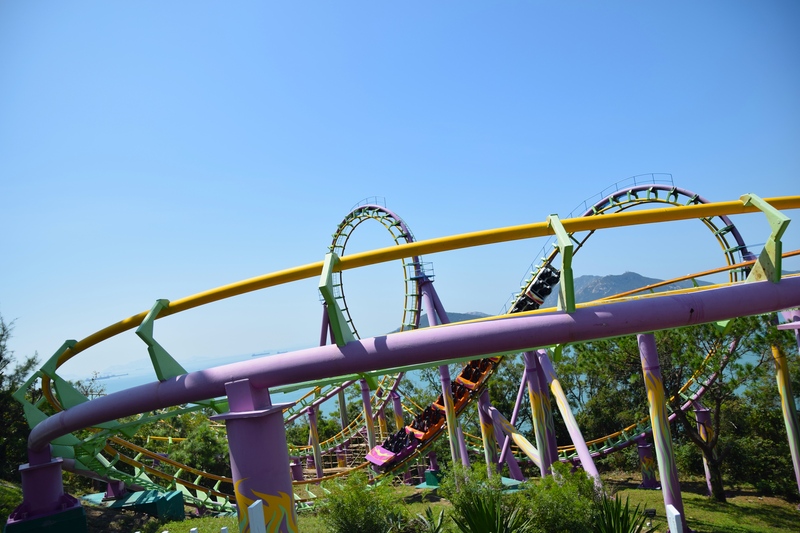 The Dragon is a pretty smooth Arrow looper with a fun layout that surprisingly does not have any corkscrews. It does though include a rapid dirt turn after its first vertical loop, much like Viper at Six Flags Magic Mountain. 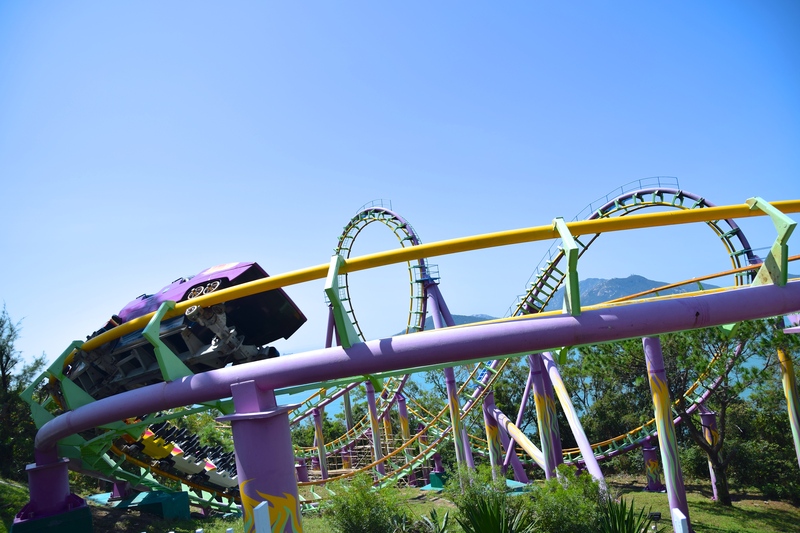 This turn faces the ocean and swoops hundreds of feet over the water below creating one of the most sensational coaster experiences ever. 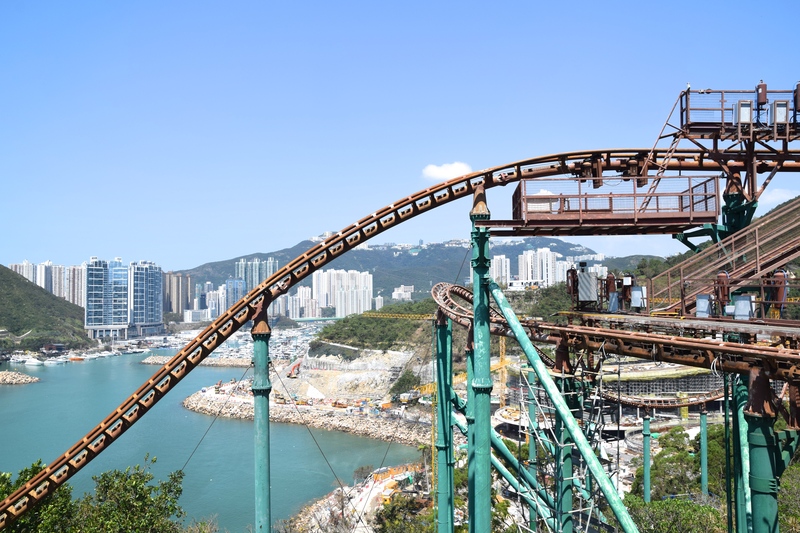 The first of two vertical loops is my favorite, as you get a view of the ocean before diving into the vertical loop, which is then followed by that amazing dirt turn discussed above. The trains are about as colorful as the track. But neither are as beautiful as the ocean that lays below. It is just crazy how much of a difference a ride’s setting can make. 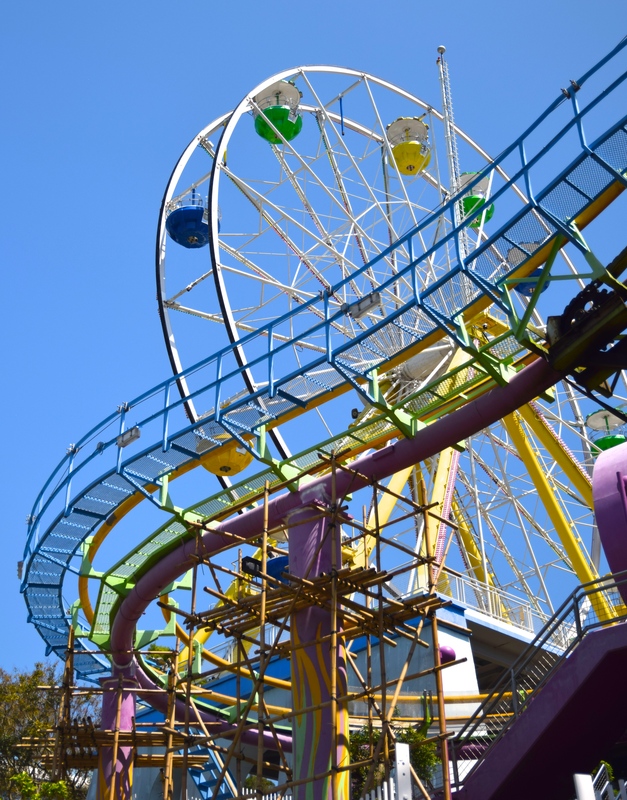 The coaster is relatively short compared to some other Arrow loopers, but has the ride experience can’t be matched. This turn is my favorite part of the entire ride, of course. It was interesting to see the park use bamboo structures to inspect the ride after the typhoon. Using bamboo is quite common in Hong Kong for construction purposes. Post-Typhoon bamboo and ferris wheel. After the ride’s dirt turn another vertical loop and sidewinder follow. To my surprise the sidewinder was very smooth and well paced. Both elements are wonderful but don’t feel as impressive after the first vertical loop and dirt turn. 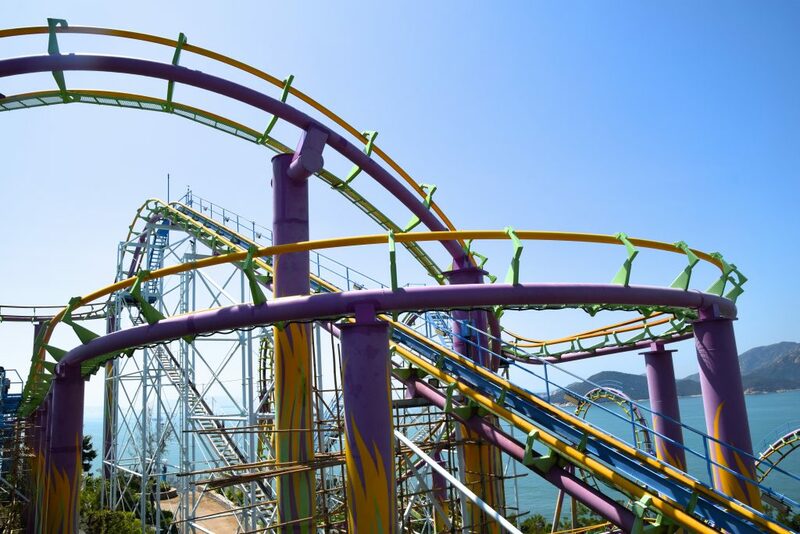 After the sidewinder the ride features an upward helix. 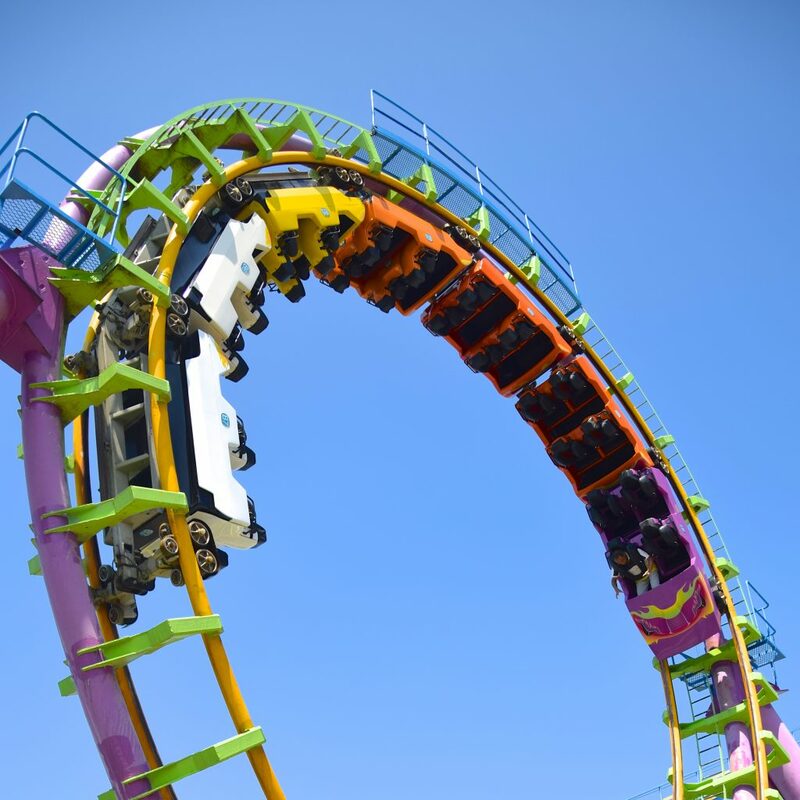 Following the helix is a weirdly banked drop that leads into another helix. It’s funny that this older (1984) Arrow is smoother than some of the later ones. 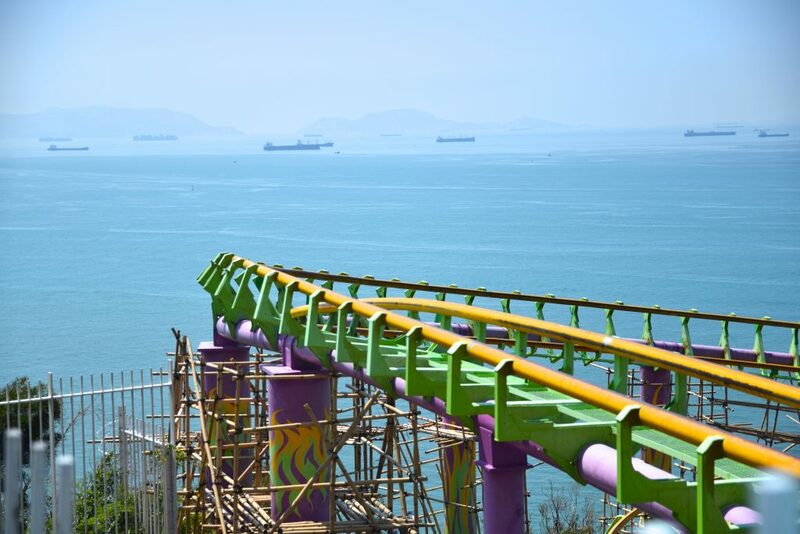 Through the helices and the final turn you get a few more glances of the ocean before hitting the second lift hill that transports you back to the station. It’s a tad challenging to visualize the park’s terrain and location of attractions without an overall view. The following picture should help with that! After riding The Dragon we rode the Eagle and started making our way over to the Wild West Mine Train. 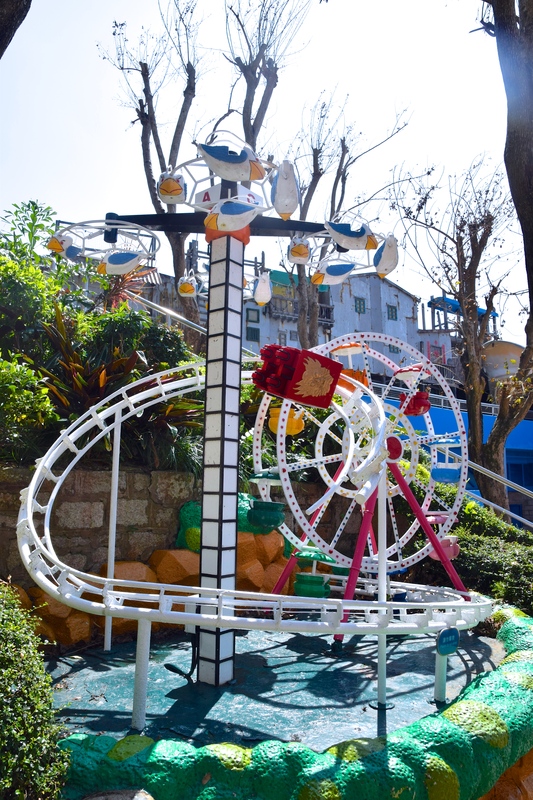 The park’s Zamperla mine train coaster was build 15 years after The Dragon on the other side of the park, so in order to connect the two the park opened a service road to the public and now allows visitors at the rescue and science center. The facilities, like all in the park, were well taken care of and seemed clean and maintained. 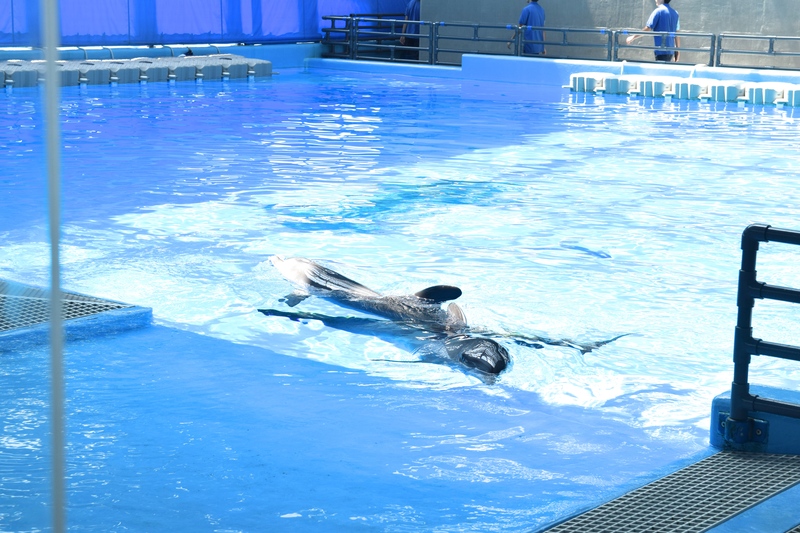 Unfortunately we did not see that at most Japanese parks, but Ocean Park certainly seemed to have their act together. 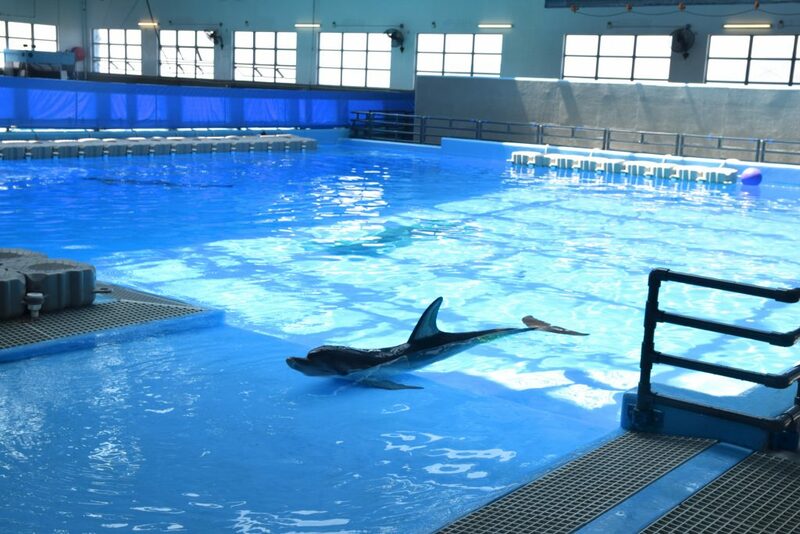 This little dolphin friend kept saying “hi”! The research facility is located in the middle of the service road/walkway and breaks up the long walk nicely. Be aware to walk long distances around this park. We made it to the weirdest looking mine train coaster I’ve ever ridden. The coaster was open and running with its VR setup. 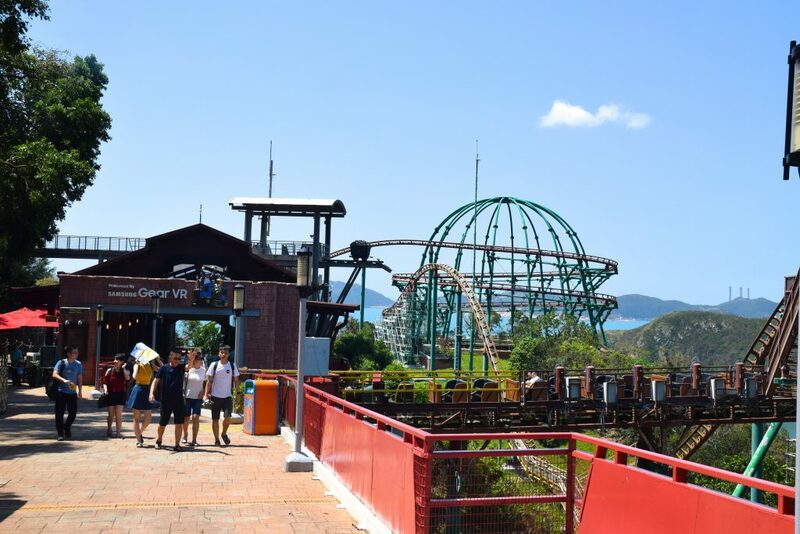 The station and queue were well maintained, though putting VR on any of the coasters at Ocean Park seems counter intuitive. 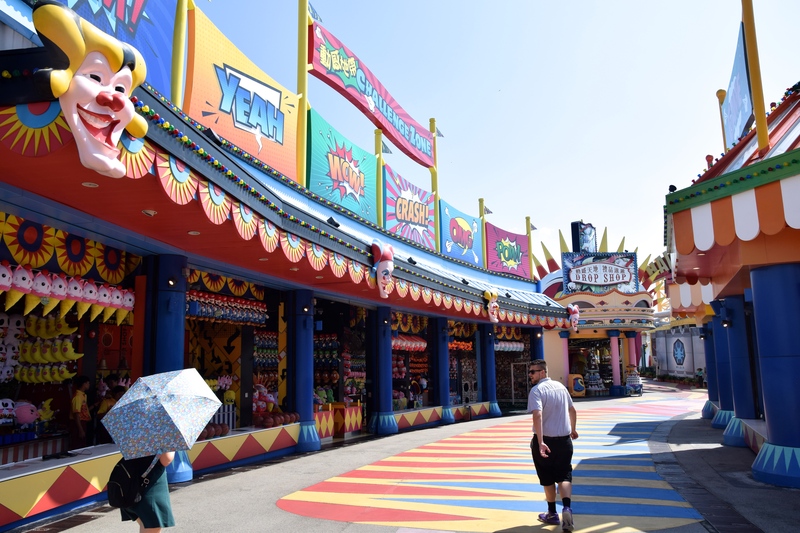 VR is usually added to create a visual improvement to a ride experience. 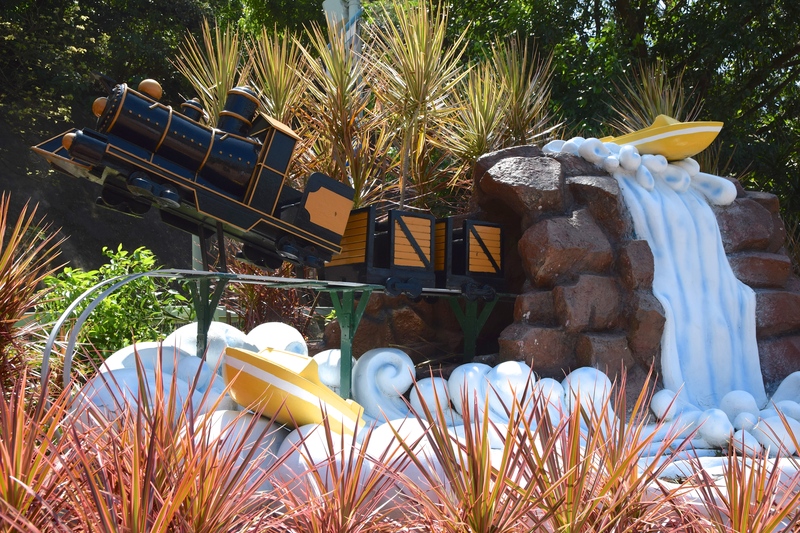 A mine train far above the ocean doesn’t need that. 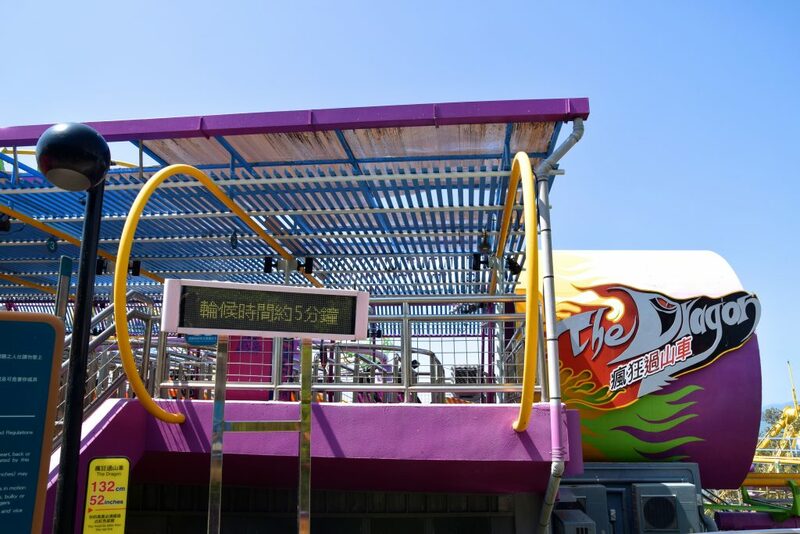 Luckily it was optional and front car and back car are reserved for non-VR riders. Wild West Mine Train is a Zamperla coaster, and the best Zamperla I’ve ever ridden. That doesn’t say terribly much and the ride had some rough spots. Overall it was a pretty terrifying, yet fun experience. 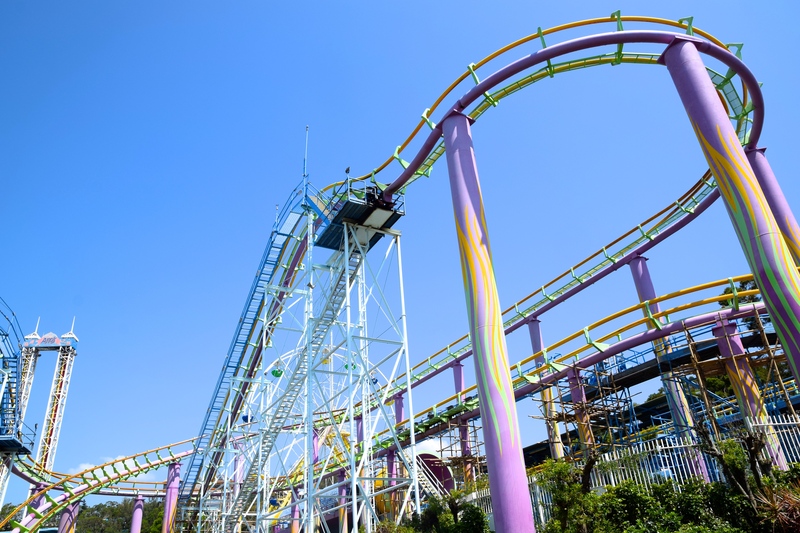 The ride has a lot of speed and airtime and feels like a whacky hyper coaster that is way too high above the ground. This side of the park, named Adventureland features both the mine train and an Arrow log flume. 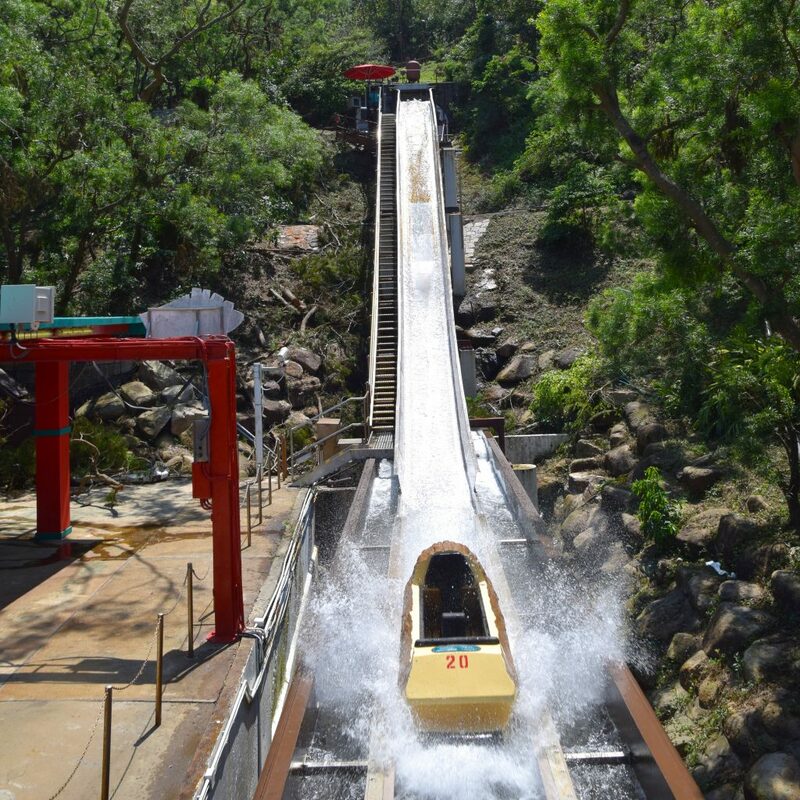 Much further down the mountain a log flume is hiding in the depths of Adventureland. 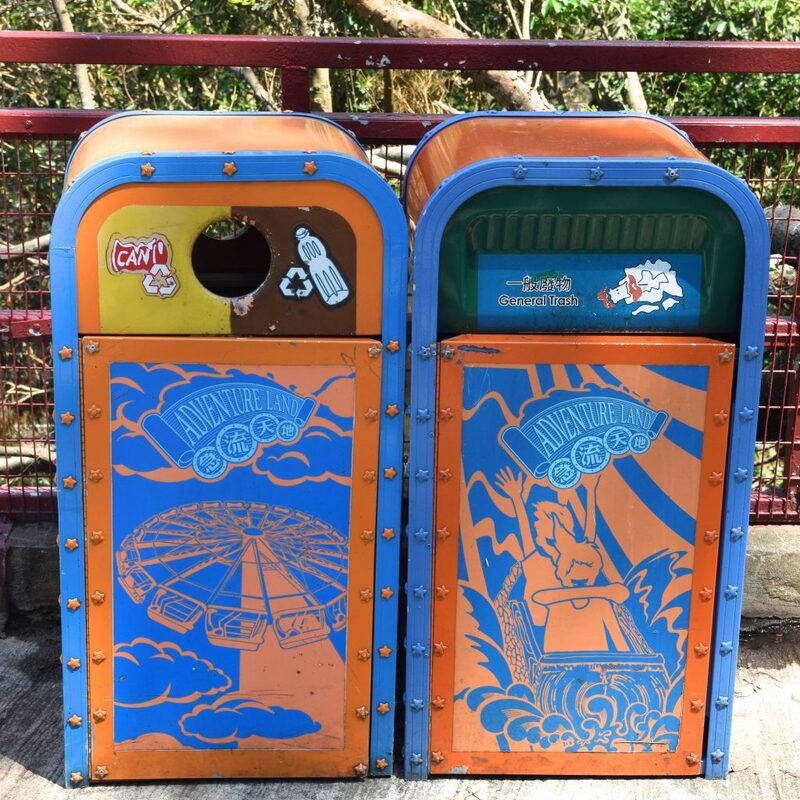 I appreciate Ocean Park’s dedication to themed trashcans and recycling! The Adventureland trashcans still have the park’s Enterprise on them, unfortunately that ride is no longer located next to the log flume and rather a haunted maze is. Perhaps they’ll bring it back after haunt season. This definitely seems like that kind of park. 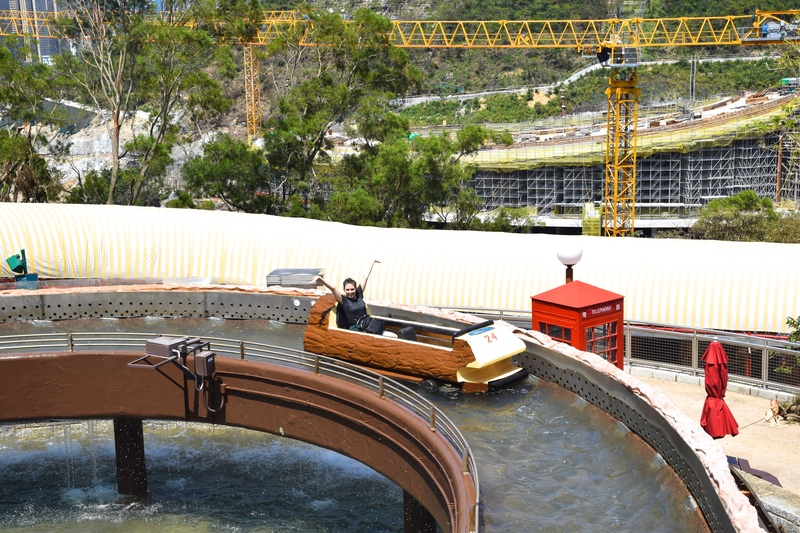 There is the log flume, which is named Raging River, and some new construction of what is likely part of the high-end apartments not too far from Ocean Park. Raging River was very cute and quite long. The finale drop was quite good. Perfect way to cool down a bit. Kaitlin agrees. Earlier in the day we really didn’t see too many people down here. When we came back later the flume seemed quite popular for the lack of crowds around the park. To continue reading the report, please head to page 2 where we’ll talk some more about Wild West Mine Train!